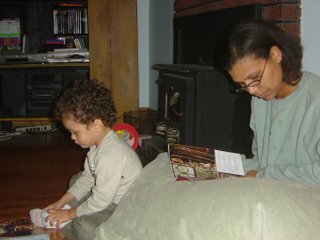 Oftentimes Wifey laments how much Little Man is like me, SRH and not like her, Zany Mama. She goes on and on and on to anyone who will listen about how much our kid looks like me. 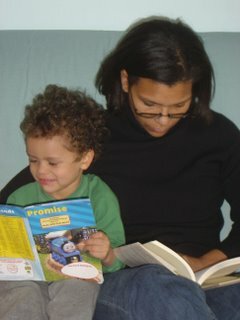 She will wax eloquent about how laid back Little Man is about his interactions with peers, à la me. She will talk to total strangers about how she seemed to be left out of Little Man’s genetic soup other than the asthma and his eyes. She will shake her head in consternation and raise her fist in frustration when he and I get enthralled in TV shows (different shows… ummm... typically. Sometimes I really want to Know how Paz is going to fix the model he broke, okay?!?! Lay off!). But this picture seems to tell a different tale. Wifey, I think the little one is more like you than you care to admit.